Brasstown Bald is Georgia's highest mountain. From its summit at 4,784 feet, there are breathtaking views of four states. On a clear day, it is possible to see as far south as Atlanta. In 1986, 11,823 acres within the Chattahoochee National Forest were designated by Congress as the Brasstown Wilderness. Since then, an additional 1,152 acres have been acquired. The bald itself, which is not within the wilderness area, is only .75 acre. The paved trails, parking areas, visitor center, etc., are outside of the wilderness. A narrow ring of ultrabasic rocks (soapstone, dunite, and olivine) completely surrounds Brasstown Bald and the ridges leading to it. This is the southernmost habitat for many northern plant and animal species, including the red-back vole. A northern hardwood "cloud forest" of huge, old birches covers the north face. 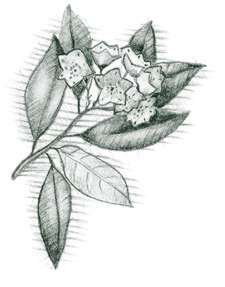 Rhododendron and mountain laurel are among the few shrubs that can survive on these thin, cold soils. The wildflower displays are particularly outstanding in the north-facing coves and down the east side of Wolfpen, one of the longest, highest ridges in Georgia. Brasstown Bald was so named because of confusion between the Cherokee words itse-yi, meaning "new green place," and untsaiyi, meaning "brass." Cherokee legend regarding bald mountains described a horrible, sharp-clawed, winged beast who attempted to steal and eat Indian children. The Cherokees cleared the forest to capture the monster and prayed to their Great Spirit, who killed the beast, restored the children, and has kept the mountaintops clear of trees ever since. A steep, paved .5-mile trail leads from the parking area to the visitor center [Fig. 30(6)] on the bald. For a fee, a shuttle bus carries visitors from the parking area to the visitor center, weekends during April and May then daily from Memorial Day through the end of October. The trail from the parking area to the summit, the Wagon Train Trail [Fig. 30(1)], is well worth walking. The old wagon train road to Young Harris leads east then north into the fantastic "cloud forest" [Fig. 30(7)] of northern hardwoods on the north side of the mountain, below the visitor center. The huge, old yellow birch are festooned with old-man's beard lichen because of the continuous moisture from cloud condensation. Rosebay rhododendron may be found near the parking lot, followed by purple rhododendron as the major heath shrub. As one ascends, the trees gradually get shorter. One soon enters a dwarfed red oak and white oak forest where the trees are very old, twisted, and limby. The top is a shrub bald with unique mountaintop species such as dwarf willow and red-berried mountain ash. The center, built of stone, offers interpretive programs tracing human and natural history of the southern Appalachian region. The Mountaintop Theater features continuous video programs. An outside observation deck provides a 360-degree view of the surrounding area. Here visitors may be awed by the view but unprotected from the wind. Because of its height, Brasstown Bald gets much weather that misses the valleys. Strong wind, rain, and lower temperatures are not uncommon. In winter there is often snow and ice. The fire lookout tower is not open to the public. Directions: From Cleveland take GA 75 north through Helen to GA 180; turn left (west) onto GA 180 (also GA 66); go 6 miles; turn right onto GA 180 spur; continue 3 miles to Brasstown Bald parking lot. Facilities: Video show, picnic area, bookstore and gift shop, hiking trails, parking lot (fee), restrooms, exhibits, observation deck, brochures, concessions, shuttle bus. For more information: Brasstown Bald, U.S. Forest Service, Brasstown Ranger District, 1881 Hwy 515, PO Box 9, Blairsville, GA 30514. Phone (706) 745-6928. Visitor center phone (706) 896-2556. There are four hiking trails, including the paved summit-access trail. All start from the parking area at the bald. Simple maps and descriptions of all four trails are available in the Forest Service brochure "Trail Guide to the Chattahoochee-Oconee National Forests." The 1:24,000 scale topographical maps of the area (Hiawassee, Jack's Gap, and Blairsville quadrangles) show three of the trailsArkaquah Trail, Wagon Train Trail, and part of Jack's Knob Trail. JACK'S KNOB TRAIL. [Fig. 30(8)] About 4.5 miles. Built in the 1930s by the Civilian Conservation Corps and reconstructed in the 1980s by the Forest Service, Jack's Knob Trail is limited to foot traffic and is rated moderate to strenuous. Descending southward from the parking lot along a ridge following the boundary of Towns and Union counties, it crosses GA 180 in Jack's Gap [Fig. 30(9)] at an elevation of 3,000 feet and ascends Hiawassee Ridge past Jack's Knob [Fig. 30(10)], elevation 3,805 feet. Jack's Knob Trail joins the Appalachian Trail in Chattahoochee Gap near the source of the Chattahoochee River. ARKAQUAH TRAIL. [Fig. 30(5)] About 5.5 miles. There is a difference of 2,500 feet in elevation as the trail descends westward along a ridgetop from its beginning in the Brasstown Bald parking area to its end at Track Rock Gap Archeological Area [Fig. 30(3)]. With a difficulty rating of moderate to strenuous, this is not considered a beginner's trail. Blue Bluff Overlook [Fig. 30(4)] is on the trail. Hikers pass Chimney Top Mountain and will be able to see Rocky Knob to the south. Plott Cove Research Natural Area [Fig. 30(2)], which is rich in herbs, wildflowers, and northern hardwoods, is north of the trail at Cove Gap. To reach the western end of the trail at Track Rock Gap, go east of Blairsville on US 76 for 6 miles, turn right onto Track Rock Road and go 3 miles. WAGON TRAIN TRAIL. [Fig. 30(1)] The Brasstown Bald parking lot is the upper elevation entrance to this trail. To find the entrance, go between the bookstore and the concession stand located in the parking area. Take the paved trail and turn right (east) onto a dirt road. This trail is a wide path originally intended to be GA 66, and on some state maps it is still shown as such. Parts of the trail cross private property. It is a moderate, 5.6-mile walk with fine views. Near the summit, the trail passes remarkable cliffs and boulderfields [Fig. 30(7)] where rock tripe, lichens, reindeer moss, old-man's beard, and club moss flourish. In early spring, silverbell, serviceberry, mountain buttercups, white saxifrage, toothwort, cinquefoil, bluets, highbush and low-bush blueberries, white and purple violets, solomon's seal and plume, pussytoes, and four varieties of trillium can be seen blooming along the trail. The trail ends at private property 2 miles south of Young Harris. [Fig. 30(3)] Like the Mayan hieroglyphics of southern Mexico and Central America, the ancient petroglyphs carved into three large soapstone boulders on the west side of the road here have resisted translation. Referred to by the Cherokees, who inhabited the area at the time of the white settlement, as degayelunha, or "printed place," the rocks have been enclosed in metal cages to protect them from vandals and graffiti scrawlers. Though the stones are weathered, their mysterious inscriptions are still discernible to travelers who take time to stop here near the foot of Brasstown Bald. Directions: On Track Rock Road off US 76, northwest of Blairsville and 4 miles southwest of Young Harris. Map References: USGS 1:24,000 series: Jack's GapHiawasseeBlairsville.